Undoubtedly the best liquid in-furrow option on the market. One size 30mL glass vial treats 500kg coarse grain. 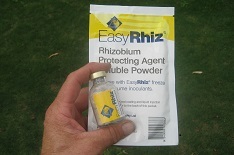 Includes EasyRhiz™ protectant seed adhesive sachet 1 per vial (~100g). Sufficient inoculant for 5L of slurry per vial. Idea for coating seed prior to seeding or direct liquid in-furrow injection. 2. 100g sachet of protectant powder. Product storage, vials should be stored between 4°C and 10°C out of direct sunlight. Mix using clean chemical residue free containers & fresh water, avoid chlorinated/scheme water and salty water. Once mixed as per instruction allow to stand for 2 to 3 hours to allow culture to recuperate from Freeze drying process. Seed (slurry)Application Sow treated seed within 5 hours. Store in cool/ high humidity post application to seed. In-furrow injection Apply with 50 to 200 litres of water per hectare. Higher water rates will deliver a better outcome in dryer soil conditions and give better furrow distribution. It is important that the injected inoculant solution contacts the seed as it is sown. Avoid banding away from the seed.